Abcmd.exe can rip Audio CD to musical files from command line. The output file format can be mp3, flac, ape, wma, or wav. You can rip each track to separate files, or rip all tracks to a single file, plus a cue file to describe the tracks format in the disc. -o: Specify output file name. Use this option when you want to rip all tracks to a single file. -ot < mp3 | flac | ape | wma | wav>: Specify output file type. -rip-to-single-file: Rip all tracks in the disc to a single media file. Example: Rip Audio CD to mp3 files, and store the mp3 files to C:\test\rip. The Audio CD is in drive G:. Each track on disc will be rip to a separate mp3 file. Example: Rip Audio CD to flac files, and store the flac files to C:\test\rip. The Audio CD is in drive G:. Each track on disc will be ripped to a separate flac file. Example: Rip Audio CD to ape files, and store the ape files to C:\test\rip. The Audio CD is in drive G:. Each track on disc will be ripped to a separate ape file. 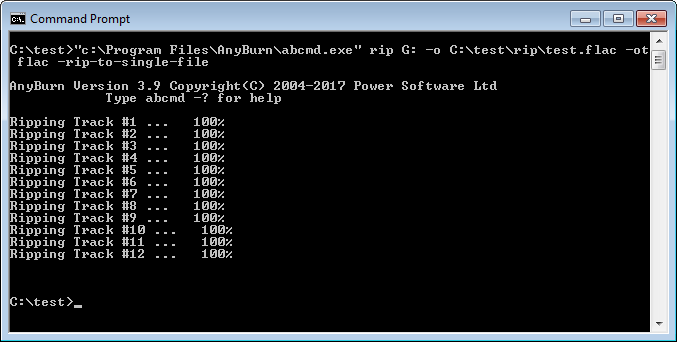 Example: Rip Audio CD to wma files, and store the wma files to C:\test\rip. The Audio CD is in drive G:. Each track on disc will be ripped to a separate wma file. 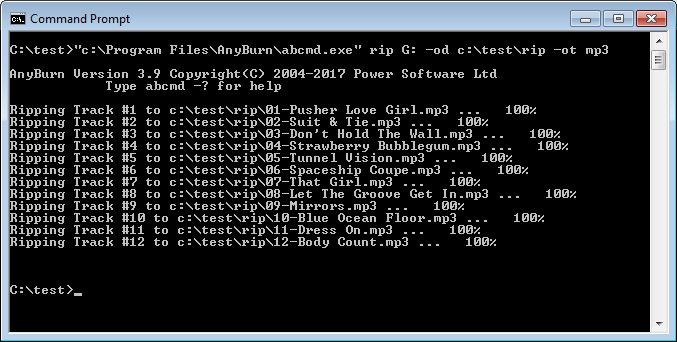 Example: Rip Audio CD to wav files, and store the wav files to C:\test\rip. The Audio CD is in drive G:. Each track on disc will be ripped to a separate wav file. Example: Rip Audio CD to a single flac file, and store the flac file to C:\test\rip\test.flac. The Audio CD is in drive G:. All track on disc will be ripped to test flac. A cue file, test.cue, will be created to describe the tracks format.